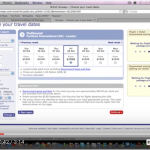 Home / Archive by category "Travel Tip Tuesday"
Travel Tip Tuesday 28 May, 2013 Welcome to another episode of Travel Tip Tuesday, this is Kerwin with Cruisinaltitude.com. In this week's episode we talk about using the Trams in Toronto, ON Canada. Watch now! http://www.youtube.com/watch?v=fiD_AO7f5_g Disclosure: I received two All Day Passes during my tour of Toronto; however, I paid for all the other times of my one week stay.